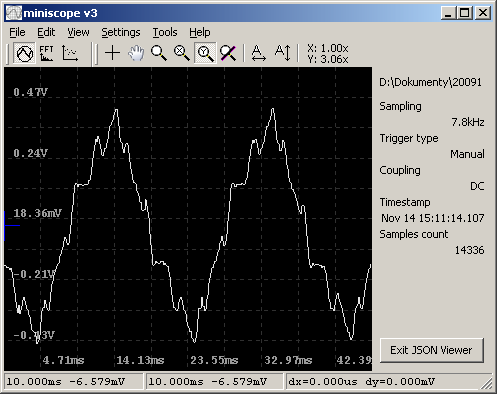 You can find several different oscilloscope projects on my pages, but documentation is usally not complete. I had not released source code of PC application. I sent it to few interested people. They usally screamed in horror seeing the mess I made. 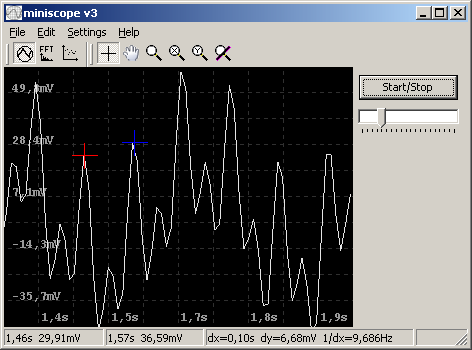 Miniscope v3 project is intented to create unified and modular user interface for PC oscilloscopes. Compiler/IDE: free Turbo C++ Explorer (BDS 2006). Installing current hotfixes (2009.10.14: rollup with Hotfixes 1-10, additional Hotfixes 11, 12, 13 are available at http://cc.embarcadero.com/ for registered users) is strongly recommended. Update: unfortunately Embarcadero support for Turbo C++ 2006 Explorer is discontinued. Currently there is now way to register new copy and receive free and legal key. To run program cc3270MT.dll and cg32.dll libraries may be required (depending on compilation options used to build specific executable). Place them in application or system directory. Miniscope software is licensed as GPL v2. If the integration of miniscope code requires the use of a license other than GPL, an alternative license may be arranged. Contact me for further details. 2008.12.30 Initial test project with display interface class and first implementation (DisplayOpenGL) limited to single channel. 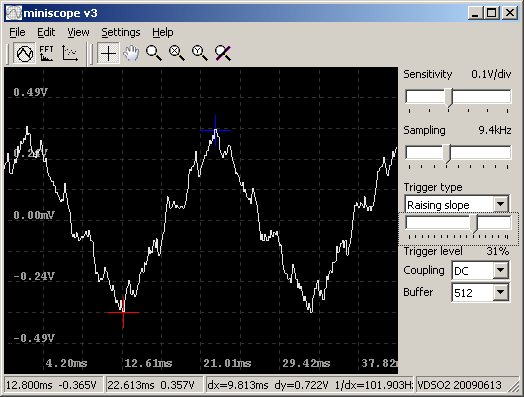 Features plot scaling and moving, screen cursors readout, amplitude spectrum presentation. Display can be resized at runtime. 2009.04.01 Initial main app to input device dll interface. 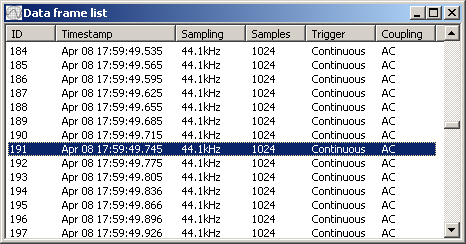 Archive contains wavein.dll library that collects samples from WAVEIN / WAVE MAPPER device. 2009.07.02 Main application, updated wavein.dll and brand new armscope.dll library (for simple hardware based on AT91SAM7S64 you can find on my page) with source code. Besides of new functionality some bugs were fixed, including unnecessary CPU cycles consumed when graph content doesn't need to be updated. changing used device dll without application restart. 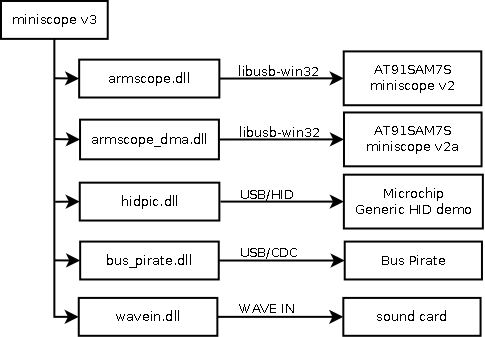 armscope.dll project is NOT INCLUDED in this package - visit miniscope v2 page to download it. 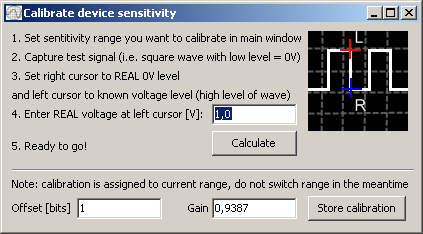 offset and sensitivity calibration for each sensitivity range (if supported by input dll). added simple plot data export to JSON and CSV format. Note: no changes to wavein.dll and armscope.dll comes with this release, only wavein.dll binary included in archive. FFT is calculated only after receiving full expected data frame from device. 2009.09.17 Added hidpic.dll input plugin. This device + library set is rather proof of concept than useful tool (well, just like wavein.dll). Hardware is PIC microcontroller running Generic HID example from MCHPUSB 2.5 package - reading ADC and switch, toggling LED when requested. Since PIC microcontroller is configured to send single ADC value per HID report there is no way to get sampling rate over 1000 samples per second (and even at lower sample rates sampling period may be unstable). On the plus side this is nice example how to create input dll using MinGW (not obvious thing is function name decoration, use -Wl,--add-stdcall-alias or -Wl,--kill-at) and work with HID devices in general. Important note: project was built using MinGW bundled with Code::Blocks 8.02. When using newer MinGW version (bundled with C::B 10.05, 4.4.1) additional compilation switch -fshort-enums is required (using enum variable as a part of interface was a risky thing). If you have PICDEM-USB or similar you should be able to test it in few minutes. Please note that all input dll projects depends on header files that are part of main application and they are intended to be put on the same directory tree level as main application project. This project is available to download from single-chip DSO page. display: X offset is not changing when using Y axis zoom, Y offset is not changing when using X axis zoom. added transparency setting to plot toolbox; setting is ignored if tranparency is not supported by OS (i.e. Win98). added info about CodeGuard usage and debug build in About window. reduced size of exported bitmap file (changed format to 8 bit). 2010.01.24 sig_test.dll - test signal generator plugin. 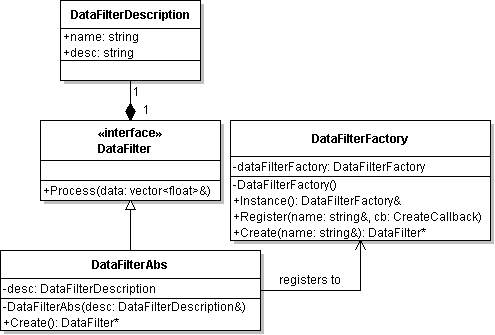 Framework for signal filters based on factory pattern (inspired by A. Alexandrescu, Modern C++ Design). This is nicely scallable pattern - to add new filter type only single cpp file has to be added to project, no changes in any other files are necessary. FIXED not working saving plot to bitmap and clipboard on Windows Vista and 7 (thanks Jakub Niziołek for the report). added data recording to custom binary files (MS3). This file format can hold up to 4 GB data (thus 1e9 samples since each sample is saved as float). With miniscope v2a hardware with maximum 0.5MS/s sampling it can record continuous data stream up to 2000 s length. File content browsing should be fast - each file has index of data frames positions and only single data frame is loaded to RAM at the time. MS3: added "file already exists" warning when selecting file for recording. Storing and loading large data collections makes it easy to further benchmark graph module performance. On my computer (Pentium M @ 600 MHz + ATI R9000) drawing 1310720 (1.25 M) samples takes about 260 ms. This time seems to be independent from current graph (application window) size but is higly dependentant on CPU speed - switching to 1.6 GHz makes drawing roughly 2 times faster. added tool repairing damaged ms3 files with missing file footer/index; this is the only only realistic type of damage - it may happen when program was killed (or - hopefully not - halted) in the middle of recording. added dll version info to Settings / input plugin list. FIXED: possible AV error at startup caused by static variables initialization hazard (DataFilterFactory::Register() called before DataFilterFactory type object was created). statistics: added RMS value measurement. 2010.10.16 Quick-and-dirty Bus Pirate support written with help of Šikloši Janoš. It uses continuous sampling mode of this device (~5720 Sps, 10-bit unsigned samples) and it requires Bus Pirate firmware 5.8 or newer. This library gives access to manual trigger only but other modes can be added including continuous streaming of course. If you'd like to make some experiments on your own than armscope_dma.dll source code may be helpful (my AT91SAM7S64-based device is also streaming data continuously, triggering and lower than maximum sampling frequencies are simulated). This library was built using Code::Blocks 10.05 and bundled MinGW (4.4.1), if you'd like to create project from scratch don't forget to add -fshort-enums to compilation options and force described previously function name decoration. Note: COM port number is COM3 by default and can be changed through configuration file, there is no configuration window for now. Configuration file is created after first run (after closing application actually) and is located inside miniscope /device subdirectory (same place where bus_pirate.dll has to be copied). 2010.10.21 Bus_pirate.dll: added raising/falling slope trigger and continuous capturing. 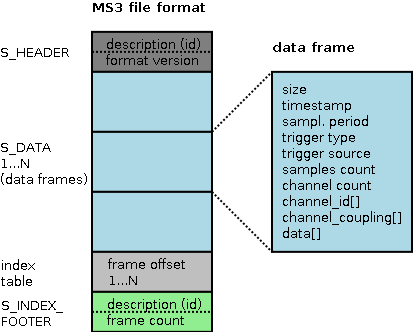 Same as with AT91SAM7S64/DMA continuous capturing allows to record very long data stream (configurable limit up to 10^9 samples in binary ms3 file). 2010.10.25 Windrider has reported problem with application hangup when closing. Apparently problem has gone with little changes to dll (bus_pirate_dll_20101025.7z), but I suspect problem was just hidden, so I would still recommend previous version.